Cupcakes 'n Daisies: Up next . . . . . 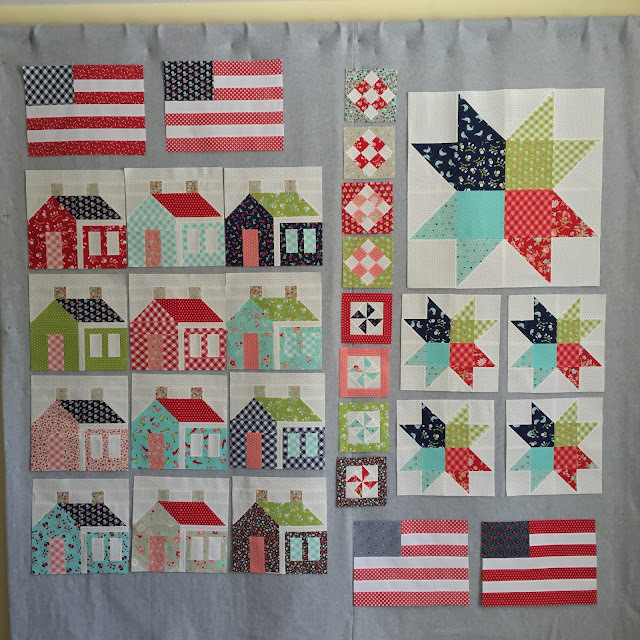 This is what is on my design wall right now, the makings of a Summerville-ish quilt. I made Summerville as a shop sample last November, and enjoyed every minute, but didn't think I would ever be piecing a second one. Well earlier this year I donated my Snapshots quilt to my hometown library for a raffle. I told the library if they raised $1,000 I would donate another quilt next year. They were very enthusiastic with their ticket sales, that quit was on display for a week in every bank in town in addition to the library, it even made it on tv. They raised nearly 3 times my $1000 goal, so now I'm piecing another raffle quilt. It's hard to pick a project for a raffle, I want it to be something I'll enjoy piecing, but not so much that I'll want to keep it, plus I think fabric that appeals to many along with an unique pattern are also important. So I'm piecing another Summerville with a few additions to make it a bigger quilt. Fingers crossed it all works out, and is done by 9/21, the last official day of Summer. I wouldn't mind finishing my raffle quilt even sooner, I have a list of Fall projects that I'm eager to start. 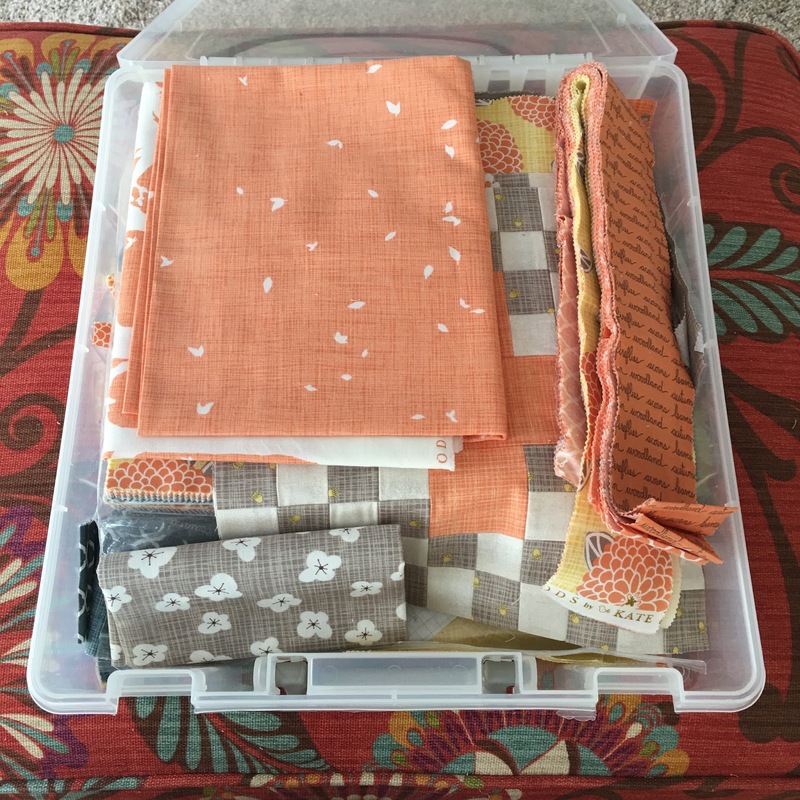 One project I would like to finish is something, anything, made with this Kate and Birdie family of fabric called Autumn Woods. 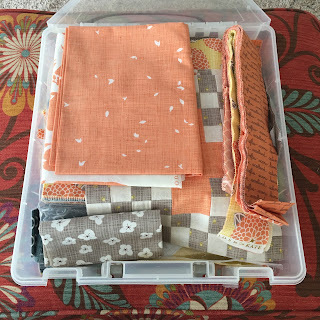 I've started two different projects but didn't like how they were coming together so as of now all my pieces, scraps, strips and squares are in this project box, waiting for me to find a project that does please me. This fabric is amazing, it shouldn't be this hard to find a good project for it. I may just make a bunch of hsts and throw them on my design wall, how could that possibly go wrong? I really love your quilt and the changes you're making! I'm sure this one will be another winner. And congrats to raising that much money for a good cause. What an excellent challenge! And wow, your blocks are awesome! They will be so very pleased! Great job? Good luck finishing it up! I'm positive your auction will be another one to raise big bucks for your charity! I love where it's heading. I was so tempted to order that Kate and Birdie fabric, but didn't have a clue how to use it. Can't wait to see what you create! I am looking forward to see what you do to make your Summerville bigger. My sister gave me the kit as a birthday gift and I have not started because I also want to make it bigger. Well done on your auction quilt! Lovely! Just curious, how many little houses have you made so far? Love that they raised way over your goal! I'm sure the second one will be even better than the first! Congratulations on a successful raffle quilt! It really was fabulous, so I'm glad you get to make a new one for them. I laughed at your line that you wanted to make a good quilt, but not so good that you wouldn't want to give it away. I hear you on that one! Anyway, I love reading your blog and seeing what's coming up next. Good luck on the Birdie fabric--it does have so many possibilities!